Successfully Added iDea USA 10.1 Inch Tablet - Allwinner A83 Cortex Octa Core CPU, Android 5.1, 5500mAh Battery, 16GB Internal Memory to your Shopping Cart. Another great tablet PC from iDea USA is here. It’s the 10.1 inch CT1080 and it has a lot to offer. 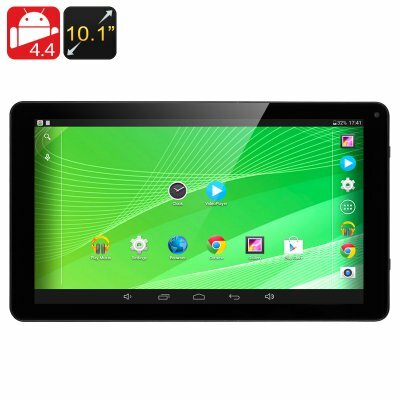 Its 10.1 inch screen will make a great home to all your media, and you will have a great portable way to watch videos, listen to music or browse the web. It will also make it easy for to interact with the device, as the screen supports 10-point multi-touch and features 1024x600 resolution. The tablet runs Android 5.1, giving you access to lots of tools, and you won’t have trouble finding a fun game or an interesting application. You will have lots of ways to customize the interface to your liking, work with voice commands and lots more. With all that functionality, you’ll be happy to know that the tablet is powered by the Allwinner A83 Cortex Octa Core CPU. The powerful processor will guarantee smooth performance and seamless multitasking. So, if you want to play a resource-demanding game or work on several things at the same time, the iDea USA CT1080 has your back. The iDea USA CT1080 is powered by a 5500mAh battery and will give you around 5 hours of continuous use. What’s more, you can load up the tablet with all the files you need thanks to 16GB of internal storage. If you think that’s still not enough, then make full use of the micro SD card slot for an additional external support of 32GB. The iDea USA CT1080 Tablet comes with 12 months warranty. Brought to you by the leader in electronic devices as well as wholesale Android tablets, Chinavasion..